Don’t we all look for a no-fail place, where we can hang out with good friends, get some tasty meals, indulge in some good drinks or distinctive beers, and just relax in the overall vibe of a music that matches the good taste of the food? People will always have that sanctuary of comfort. It is some place they will swear by and invite everyone else to try. 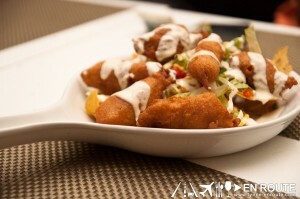 And Harvest Gastropub may be one of those that will fit your style. Harvest Gastropub is a realatively new joint in the Fort Bonifacio area. The minimalist lettering may not give an impression that it is a watering hole for the Fort Bonifacio working population, but thanks to tables and chairs outside, accompanied by the occasional drinkers and chatters lounging around the sidewalk, you will be invited to give it a try and see if Harvest Gastropub has what you are looking for. Harvest Gastropub focuses on churning out great tasting food. It is not too much on the experimental type. Also, Harvest Gastropub turns into a bar at night, which is where that watering hole part comes in. Start off with some of their appetizers like the Butter Parmesan Chicken Tenders (PHP 185.00). Tender chicken strips, smothered in butter and parmesan cheese. It will be a bit on the salty side, which will probably usher you to begin ordering a round of beers or cocktails. More on that great stuff in a bit. 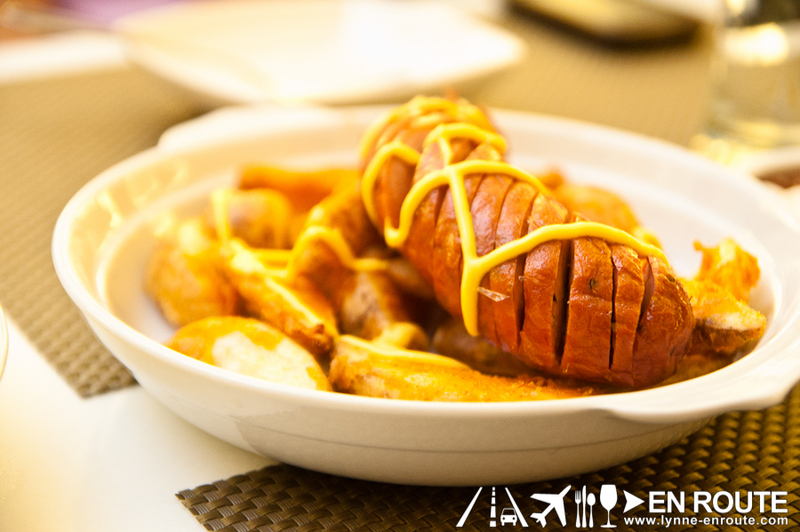 Other appetizers for those who have a Western inkling would be the combination of the Hungarian Sausage, Cheese, and Fries (PHP 195.00). The salty cheese spread that is all over the hungarian sausage will be neutralized by starchy fries, all combining into a satisfying clunk in your belly. Feeling Western all the way? 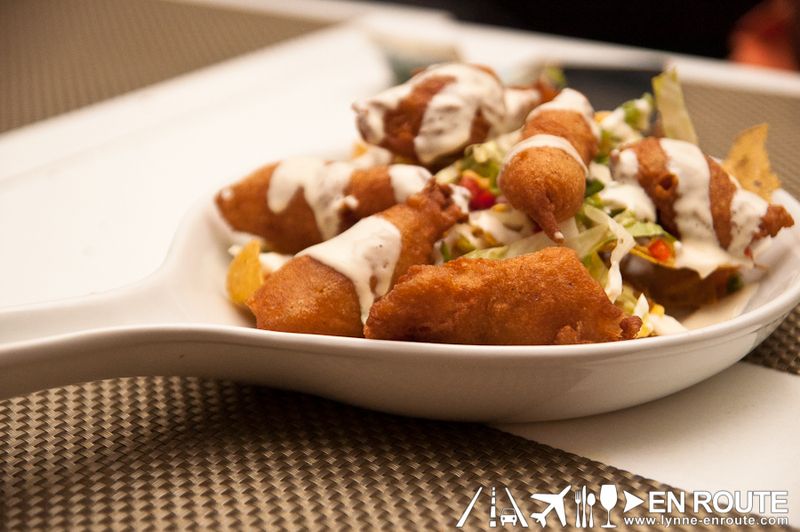 Then get some Baja Fish and Chips (PHP 195.00). 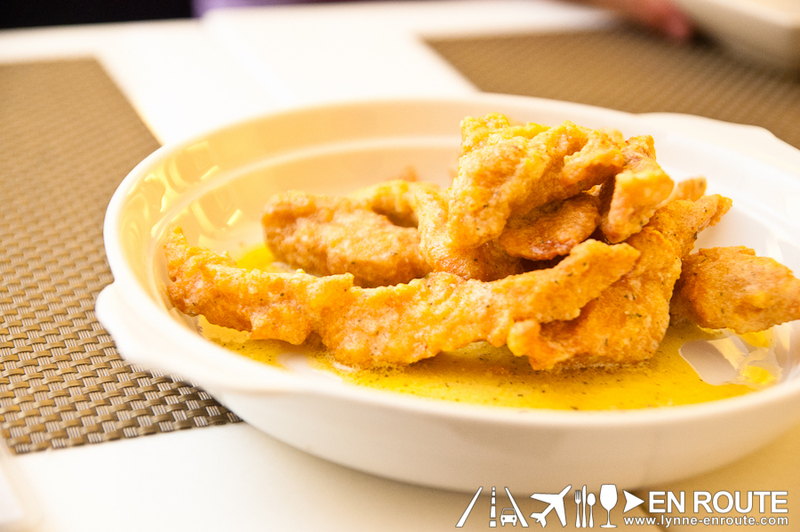 While it may not win any awards in terms of presentation and authenticity, this one is a good snack with the crunchy and tasty batter complementing Dory Fish. You will see that Harvest Gastropub is not only about American comfort food. It is about some Filipino Comfort food and appetizers, too! 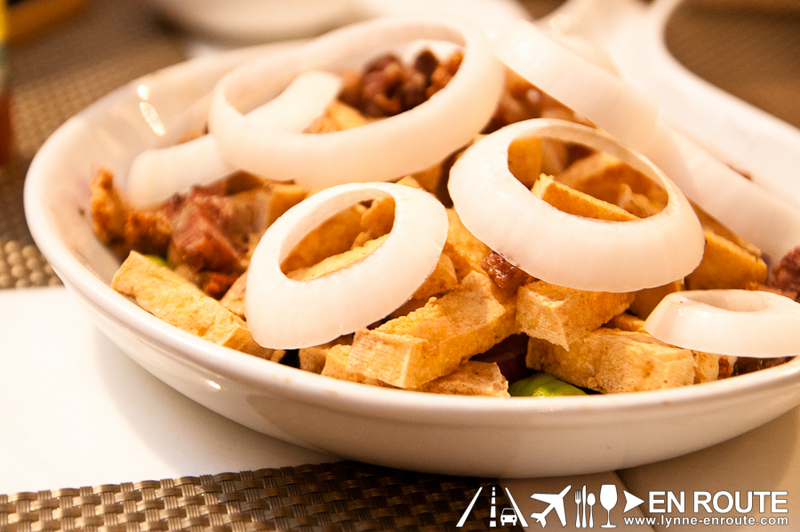 Take the Tokwa’t Bagnet (PHP 220.00) for instance. Delectably crunchy deep fried tofu and double fried pork belly. It’s obvious by now that this is not the place for the weight watchers in mind. But seriously, would you really be wanting to watch your weight with all this around you? 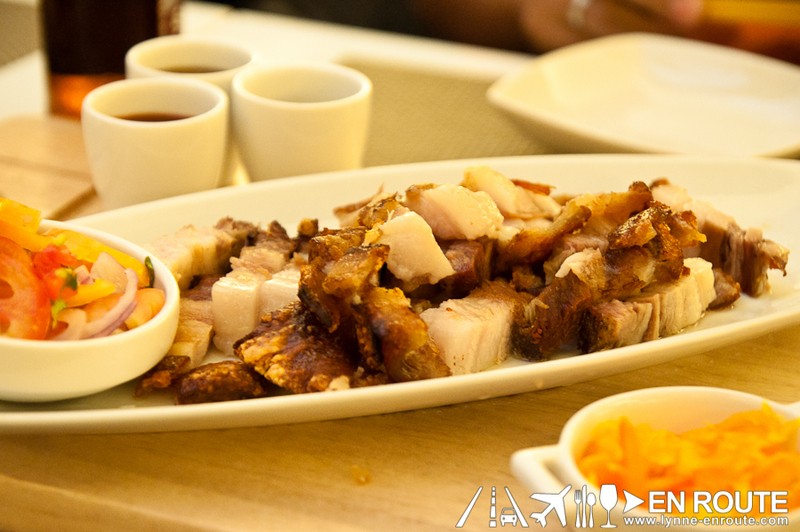 The first encounter of a tokwa’t bagnet was in the private hangout turned restaurant Roofdeck Bistro in Quezon City. 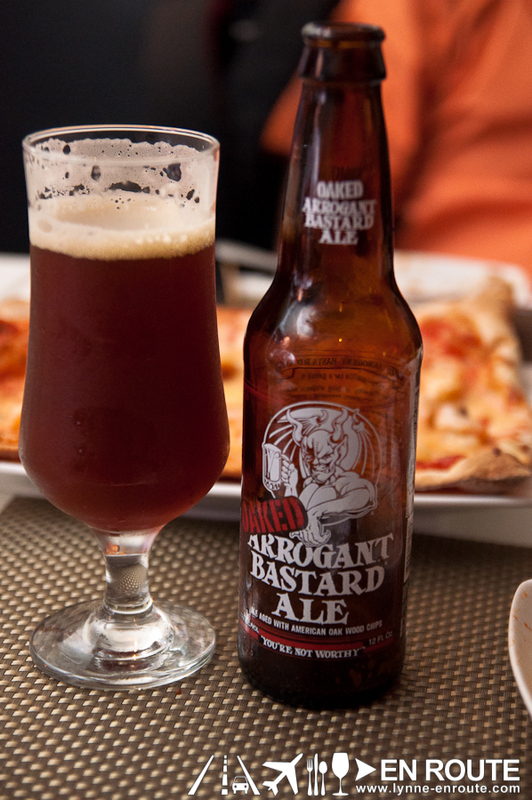 Oh, and a little dash of Italian: Harvest Gastropub serves some great pizzas! 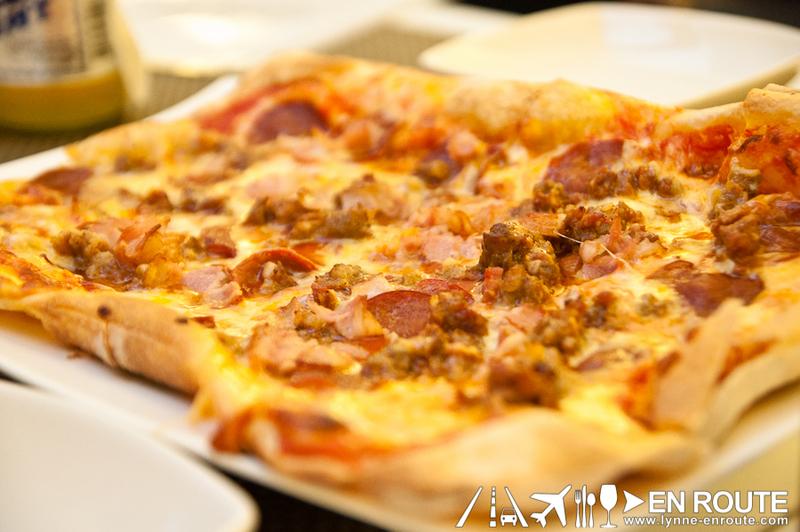 Since this post is becoming a tribute to all things meaty, what else would complement everything here but with a Meat Overload Pizza (PHP 395.00) decked up with salami, ham, bacon and chorizo. The crust tastes fresh and crunchy, which you will need s as not to be overwhelmed by the generous toppings of meaty goodness. It has been all about food so far, and you are wondering how you will push that all down? With some liquid, of course! Preferrably… beer. While you can pick your normal San Mig Light, you will probably want to upgrade your distinction with the time-tested Pale Pilsen. Or, take your pick in some of the international craft beers that Harvest Gastropub carries. The great thing about craft beers is that these breweries begin experimenting with variations of brewing beer to totally satisfy the uncountable permutations of distinctive beer lovers (we are talking about ones who like the taste of beer, and not just plain alcoholics). First encountered in the Howzat English Pub in Kalayaan Avenue, this beer wastes no time in telling you that you probably will be making a grave mistake in thinking this beer can be appreciated by everyone. This bottled monster is filled with the ingredient that gives beer that bitter taste (hops), and the Stone Brewery uses a variety that they won’t even reveal! It will take some time and courage to finish this bottle, but for the hopheads (a term used for those whose mouths water at the mere mention of beers heavily fortified with hops), this one is a pleaser. 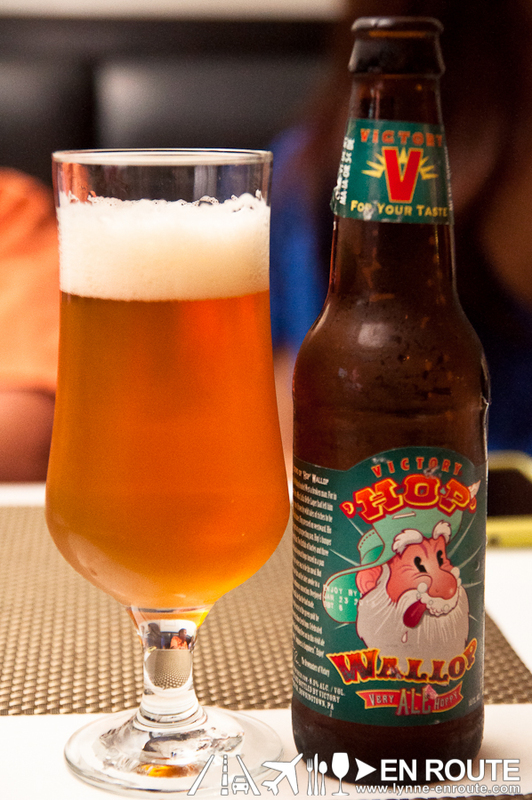 One look and you might surmise that the Victory Hop Wallop might be a kiddie cola. And then you pour it into a glass, and find out it is a beer. 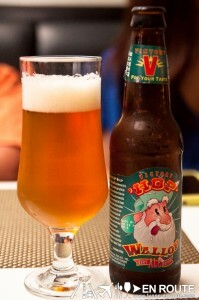 Then you sip it, and the deception of your life sinks in that this beer, with an icon of what looks like a retarded lost dwarf that Snow White never bothered to meet, has taken all that bitter feelings and channeled it into this beer, resulting in a hoppy (bitter!) taste that might numb the sensations. It is suggested you drink this beer last, as any other beer will taste like water in comparison. It is definitely reserved for the more distinct beer tasters. If you are not a beer person, their cocktails are quite respectable. 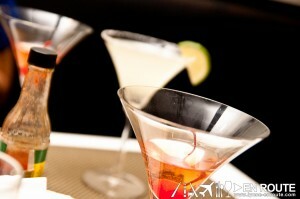 If you are a lady and are a fan of cocktails, then you will like Harvest Gastropub on a Saturday night. During this visit, it seems like Harvest Gastropub has made Saturday their ladies’ night, with free cocktails to the ladies, with it changing by the hour on the hour. As you can see in the picture, this was capitalized tremendously. It is still a relatively new place and this might work to your advantage if not a lot of people know about it. Come in any time of the day for a sampling of tasty wares, or head there at night and feast in the reaping of good food, good music, and good vibes. The Fort Bonifacio is very much ripe for this place. 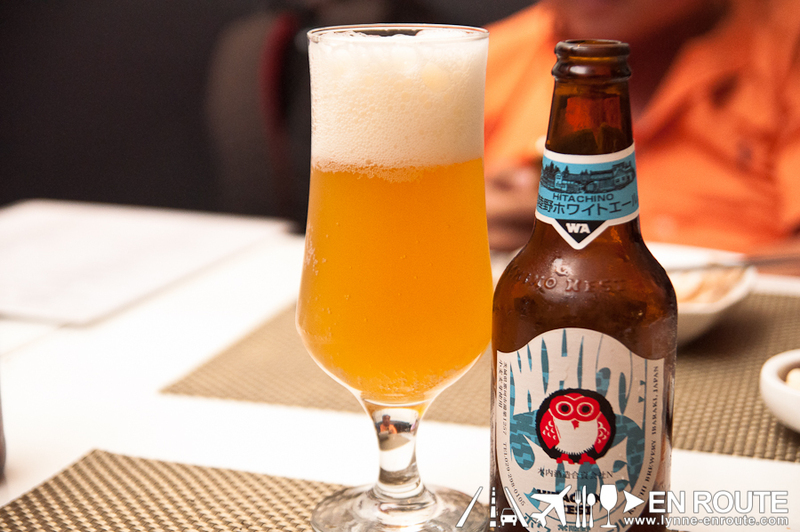 Are Craft Beers your thing? Harvest Gastropub is located at 31st St. cor. 1st Avenue, Ground Floor, Grand Hamptons Tower, Bonifacio Global City, Taguig. This is for our undergraduate thesis.